The Caller-Times examined 32 permits from closed South Texas mines that had used a water-pumping method to mine. In each case, companies were permitted to leave behind minerals such as uranium, molybdenum and selenium at higher levels than were listed in the original permit. Other permits were reviewed, but it is unclear if a similar pattern was repeated because the boundaries of mine areas were changed or merged with other mines, making it difficult to establish what the stricter, original cleanup standard should have been. Mining companies say the permits require them to clean groundwater that never was fit for human consumption. They also say there never has been a documented case of drinking water contamination from their mining operations. The increases that appear in the amended permits aren't uniform. In some cases, companies were able to meet the restoration target for one mineral but reported 10- and 20-fold increases in others. Older mines tended to require more drastic permit amendments than mines started later. "It's a kind of a shell game," said George Rice, a groundwater hydrologist hired by a citizens' group in Kleberg County to help enforce cleanup standards at a mine known as Kingsville Dome. "They tell people, 'Here are the standards we're going to meet.' All along, they know they aren't going to meet those standards and the state knows they aren't going to meet those standards." John Santos, a geologist with the Texas Commission on Environmental Quality, said he performed an informal examination of all permits and produced similar results. It is unclear if the study ever appeared in written form. The commission is the state agency that agreed to the permit amendments. Selenium in low doses is necessary for human health, but in high doses is linked to respiratory inflammation. Molybdenum in high doses is an irritant of the ears, nose and throat, according to the Centers for Disease Control. Uranium, mined primarily for use in nuclear power plants, is linked to kidney failure, according to the CDC. These minerals occur naturally in the mining areas and across South Texas. The issue of how far a mining company must go to restore a property's groundwater has cropped up in a handful of court cases. In a federal lawsuit involving two ranches in Webb and Duval counties, a federal judge recently ruled that the groundwater on the property was used for drinking water before mining, which could mean companies are required to clean water to drinking water standards. In two affidavits filed in federal court, ranchers claim the levels of selenium and uranium left behind by Cogema Inc. impacted potential ranching and hunting uses. The ranchers say mining company representatives promised that the water would be restored to pre-mining conditions. 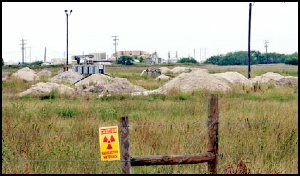 The owner of one ranch told the court in an affidavit that she and her husband would not have leased their property to uranium miners if it wasn't going to be restored to pre-mining conditions. "We all recognize that water is the most valuable resource in Texas," the rancher stated in court documents, "and to permit Cogema to not do what it promised the landowners is nothing more than tolerating abusive behavior and breach of contract." A lawyer representing Cogema Inc. disputed the claims that the water ever was potable. "The water in the mining zone wasn't suitable for human consumption before the mining started," said Carlos M. Zaffirini Sr. of Laredo. "It is not suitable today. What they are complaining is that the levels are greater inside the mining zone. We aren't talking about wells outside of the mining zone. All of the wells outside the mining zone are at background levels." Zaffirini said that claims the groundwater was used as drinking water before mining are fact questions to be settled at trial. In an instance in Kleberg County, the operator of the Kingsville Dome mine, Uranium Resources Inc. of Lewisville, entered into a negotiated agreement that established groundwater standards. Uranium Resources Inc. also agreed to fund a citizens review board to independently monitor cleanup progress. The result, according to the chairwoman of the citizens review board, has been mixed. "We felt they had not complied with the agreement," Carola Serrato told a crowd in Goliad in September. "We filed a report saying URI had not complied with its restoration responsibilities." Officials with the company said it met the terms of the agreement. Industry experts say that testing when the water pumping mining technique, known as in-situ leach mining, was in its infancy wasn't accurate, and mistakenly set high standards for groundwater remediation. Craig W. Holmes, a consultant to the industry, said that when companies began mining South Texas for uranium 30 years ago, they didn't drill enough monitoring wells and at times did not hit the ore body with the monitoring well. Because of this, the restoration standard was based on data that had less contact with uranium. When it came time to clean up, the companies realized the calculations were in error. "That's what they say," said Santos, the Texas Commission on Environmental Quality geologist. "It's possible." Restoration standards are based on the condition of the aquifer before mining, and companies are required to restore to levels consistent with pre-mining conditions, according to the statute. In each case, the Environmental Protection Agency declared the mining area an exempt aquifer, which signifies that the underground water is not used and unsuitable for human consumption. One of those exempt aquifers, in Live Oak County, sits on the banks of Lake Corpus Christi, which provides drinking water to Corpus Christi. When the mining operation there closed in March 1999, the Texas Commission on Environmental Quality allowed miners to leave behind underground water with 10 times the amount of uranium listed in the original permit. Ben Knape, who oversees the state agency's underground injection control program, said provisions in the law allow for the amendment to permits within certain ranges that pose little risk as in this case. The section of the Texas Administrative Code governing uranium mine cleanup says the state must take into account potential uses of groundwater and pre-mining uses of the groundwater. Other possible reasons for the permit amendments include the cost of restoration efforts, potential harmful effects and consumption of energy and water in further cleanup. 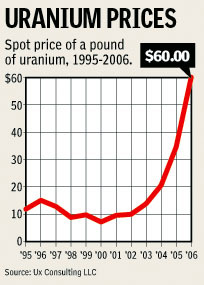 Most of the permits reviewed came from mines that closed in the 1980s and 1990s, when the price of uranium plummeted after the collapse of the Soviet Union sent a wave of inexpensive nuclear material across the world. A recent spike in prices, combined with forecasts predicting demand will outstrip supply, has brought a renewed interest in uranium mining. Brad Moore, an exploration and land tenure manager for Uranium Energy Corp. in Goliad, said the technology has improved. "What happened 30 years ago could not happen today," Moore said. "The industry evolved and regulations evolved." "I don't agree with some people that this is a mature technology," said Kim Jones, a professor of environmental engineering at Texas A&M University-Kingsville, who is researching new cleanup technologies. The method uranium miners use throughout the world was pioneered in South Texas about 30 years ago. Uranium mining always is done in areas where there is naturally occurring groundwater. During extraction, miners are required to remove slightly more water than they pump into the ground. This prevents uranium-contaminated water in the mine from migrating and contaminating neighboring waters by the creation of a "low-pressure" zone. At the times mines are closed, miners pump more water into the ground to flush the aquifer. This water, like all water, has naturally occurring amounts of oxygen in solution. Environmentalists argue that this water, and the amount of oxygen inside, can continue to interact with uranium and allow it to stay mobile. "After you turn off your pumps, there is a possibility that it will move off site," said Rice, the groundwater hydrologist hired by Kleberg County residents. "There's a very good reason for the regulations - if not brought back to pre-mining, I think long-term monitoring is the answer." Assessing the risk to humans and livestock is difficult and technical. "The groundwater moves," Jones said, "sometimes fast, sometimes slow." Miners scoff at this explanation, because they say groundwater moves too slowly to cause a serious risk - about 30 feet per year in some cases. "The water moves slowly," said Mark Pelizza, vice president for environmental affairs for Uranium Resources Inc. "The mineral doesn't." He says geologic chemistry locked uranium in place before mining and will continue to do so after mining has ceased. Concerns that in-situ leach mining might impact groundwater are well known, yet it is unclear whether the pattern of amending permits in Texas is repeated throughout the country. Bill von Till of the Uranium Recovery Branch of the Nuclear Regulatory Commission, which regulates uranium mining in states that don't have their own rules, said the commission has overseen about four restorations. In each case the miners met the requirements for some minerals, but not for others. "What the groundwater community has found over the years is that trying to achieve cleanup to background is virtually impossible, and it's moving to a risk-based approach," von Till said. The exempt aquifer status granted to the miners removes the burden of federal Safe Drinking Water Act standards because most mining regulated by federal agencies occurs in remote areas where people are unlikely to dig wells or rely on groundwater. Von Till said though groundwater inside the mining areas tends to containincreased levels of some minerals after closure, "outside the mine area, everything is looked at as a potential drinking water source."